Lewis Hamilton won the Abu Dhabi Grand Prix today in his Mercedes GP ahead of Nico Rosberg in second place 0.4s behind - clinching the world championship title. Sebastian Vettel finished in his Ferrari in third place, 0.8s behind the winner. Max Verstappen (1.6s) in the Red Bull finished in fourth, followed by his team mate Daniel Ricciardo (5.3s) in fifth, Kimi Raikkonen (18.7s) in the second Ferrari was sixth, Nico Hulkenberg (50.1s) in his Force India-Mercedes was seventh, his team mate Sergio Perez (58.7s) was eighth, Felipe Massa (59.4s) in his final race for Williams was ninth and Fernando Alonso (59.8s) in the McLaren-Honda was in the final points paying position in tenth. Before the start, with the championship battle coming down to the last race, Lewis Hamilton needs to win the race and have Rosberg finish fourth to take the title, while all Rosberg has to do is finish third to secure the title. The top ten starting on ultra-soft tyres, while Ricciardo and Verstappen start on super-soft tyres. Jenson Button and Felipe Massa both starting their final career race. The cars come around on their formation lap - the lights go out and the race begins with Hamilton takes the lead from Rosberg, Raikkonen, Ricciardo, Vettel, Hulkenberg and Perez. Verstappen spins, but continues. The two Force India™s battling for position. Magnussen pits for a new front nose and continues. On lap 3 Verstappen battles with Nasr for 14th place. 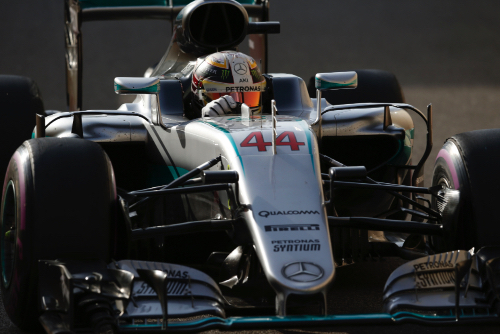 Hamilton sets fastest lap at 1m46.339s, and then again at 1m47.292s. On lap 5 Verstappen passes Kvyat for 13th place. Massa and Bottas fight for ninth place - Massa taking the place. On lap 5 Hsmilton sets another fastest lap at 1m46.191s. Bottas pulls into the pit with a reported problem with his dampers. On lap 8 Hamilton pits from the lead switching to soft tyres. Raikkonen pits at the same time for soft tyres as well. Hamilton rejoins in seventh. The next lap Rosberg pitsas well, switching as well for soft tyres. Ricciardo leads, and sets fast lap at 1m46.129s, Perez runs second followed by Hamilton, Verstappen and Rosberg. On lap 10 Ricciardo pits and switches to soft tyres. At lap 10 Hamilton once again leads, followed by Verstappen (1.5s), Rosberg (2.5s), Raikkonen (3.4s), Ricciardo (4.0s), Vettel (4.6s), Hulkenberg (12.6s), Button (13.9s), Perez (14.4s) and Grosjean (18.4s) in tenth position. On lap 13 Button goes off track but continues - he tells the team, œsomething feels a bit wrong with the steering. He retires the car. On lap 14 Hamilton sets another fast lap at 1m46.107s. On lap 16 Kvyat retires the Toro Rosso on the side of the track. Hamilton reports a lot of overall sliding on his current set of tyres. On lsp 18 Alonso passes Grosjean for tenth place on the outside of turn 11. On lap 19 Ricciardo attempts to pass Raikkonen for fourth place, but can™t pull it off. On lap 20 Rosberg passes Verstappen for second place. On lap 21 Verstappen pits from third for soft tyres, and rejoins in eighth. Rosberg sets fast lap at 1m46.022s and then again at 1m45.975s, and then again at 1m45.942s. On lap 24 Ricciardo pits from fifth for soft tyres. At lap 25 Hamilton leads Rosberg by 3.9 seconds, followed by Vettel (14.5s), Hulkenberg (27.4s), Verstappen (30.3s), Perez (32.1s), Ricciardo (33.2s), Raikkonen (33.6s), Massa (39.8s), Alonso (44.3s) and Hulkenberg (49.8s) in tenth. On lap 27 Hulkenberg pits for soft tyres. Ricciardo passes Perez for fifth. Verstappen sets fast lap at 1m45.363s. On lap 29 Hamilton pits from the lead for another set of soft tyres. Ricciardo sets fast lap at 1m45.058s. On lap 30 Rosberg pits from the lead for soft tyres, and rejoins behind Hamilton. Ricciardo sets another fast lap at 1m44.885s. Vettel leads Hamilton by 7.6 seconds, over Rosberg, Verstappem and Ricciardo. On lap 34 Alonso passes Perez for eighth, but Perez comes back for the position. At lap 35 Vettel leads Hamilton by 5.1 seconds, followed by Rosberg (5.8s), Verstappen (9.3s), Ricciardo (10.5s), Raikkonen (16.5s), Hulkenberg (38.0s), Perez (39.8s), Alonso (42.2s) and Massa (51.1s) in tenth place. On lap 38 Vettel pits from the lead and takes a new set of supterP-soft tyres, rejoining in sixth. On lap 39 Vettel sets fast lap at 1m44.094s, running in sixth. On lap 40 Vettel passes his team mate Raikkonen for fifth place. On lap 42 Palmer touches Sainz and spins the Spainard. Sainz limps around with a gearbox issue. Mercedes tells Hamilton to pick up the pace, as Vettel is an imminent threat. On lap 46 Vettel passes Ricciardo for fouth and now trails Hamilton by 6.4 seconds. Verstappen closes to 1.7s behind Rosberg in secord. At lap 50 Hamilton leads Rosberg by 1.0s, followed by Verstappen (2.5s), Vettel (2.7s), Ricciardo (7.9s), Raikkonen (15.9s), Hulkenberg (47.1s), Perez (51.1s), Massa (54.9s), and Alonso (57.7s) in tenth place. Vettel passes Berstappen for third place. On lap 54 Vettel closes on Rosberg in second place.